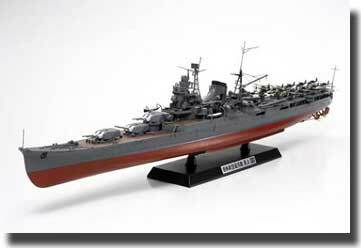 TAMIYA 78021 JAPANESE AIRCRAFT MOGAMI CARRYING CRUISER (1/350)! • This is a 1/350 scale assembly kit model. • You can choose to construct either a waterline or full hull display model. • Assembly of the deck and hull for such a large model is difficult, but this kit includes reinforcing frame parts and screws to enable accurate assembly. • The display stand securely attaches to the ships hull via screws. • The metal name plate enhances the finish of the model. • Parts for 11 highly detailed Aichi E13A floatplanes are included and stands are also Included to enable display of 6 floatplanes in flying position around the ship. • The bridge windows and search light lens are made of transparent parts. • High quality photo-etched parts depict details such as floatplane propellers and crane are included. • The masts and radio antennas are made of reinforced ABS resin. The aft mast can be removed thanks to polycaps for easy storage. Metal plated shaft is used for the screw shaft. The anchor and chain are also depicted with metal parts. • Machine gun parts feature laser processing for a sharper, more realistic finish. • Parts are included to depict main gun barrels at 2 different elevation levels. Polycaps enable switching of gun turrets as well as free turret rotation for a variety of displays.